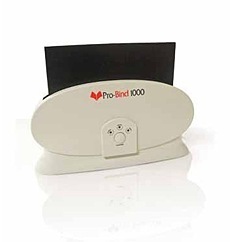 The Pro-Bind 1000 is able to thermal bind and soft and hard covers with the simple touch of a button. This simple one-touch operation has a binging capacity of up to 3/4” spine. The unit is designed for 11 x 8 ½ inch sheet or smaller. This lightweight system is portable to fit any office needs and only weighs 2 pounds. The Pro-Bind 1000 includes an automatic energy saving mode, which shuts off the machine when it is not being used for a specific period of time. It has never been easier to make a book! In just one minute you have a completed perfect bound book ready to use! However, there are two cycles that are required when binding using the Pro-Bind, because if this is not completed, the bind will not be secure and pages may fall out. The Pro-Bind 1000 is a low volume binding machine that was built to handle about 80 books each month which is about 1,000 books a year. Another great thing about it is that it requires no maintenance! Just shut the machine off when it is not in use! The Pro-Bind 2000 is a heavy duty professional thermal binding system that is designed for organizations that are looking for a machine that is both dependable and easy to use. 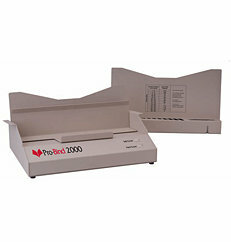 The Pro-Bind 2000 offers the ability to bind documents up to two inches thick, or you can bind multiple documents at a time for a total binding thickness of up to two inches. This desktop machine is built out of 18 gauge steel which makes it durable even though it only weighs 10 pounds. It can bind documents from 1/16” x 2” spine with the touch of a button. There is no wait time for the Pro-Bind 2000 to warm up and the cycle time is only 30 seconds for soft covers and 60 for had covers! This machine is capable of binding multiple documents at one time, and it can produce more than 420 soft cover books in an hour! The Pro-Bind 2000 has an audible tone alerting you that the binding cycle is completed, and it will shut off automatically. Another great thing about it is that it requires no maintenance! Just shut the machine off when not in use. If you have any questions or are interested in purchasing a Pro-Bind Machine , visit us at SpiralBinding.com. We have great pricing on a full line of Pro-Bind Thermal Binding. Call us at 1-800-631-3572 for more information.